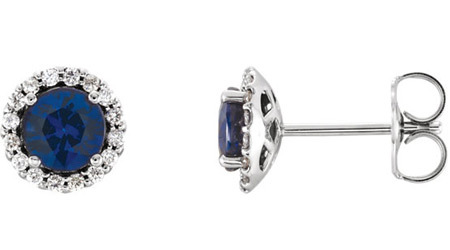 Genuine blue sapphire gemstones are the focal point of these diamond halo stud earrings set in designer-style basket settings crafted in solid 14k white gold. 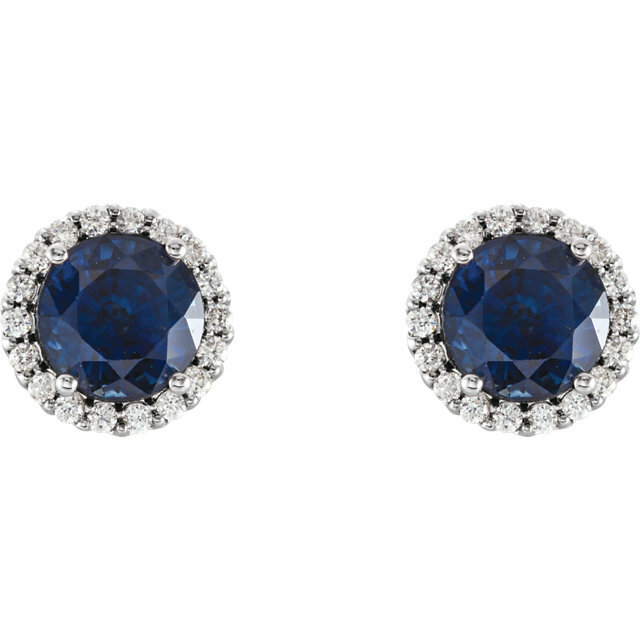 The faceted blue sapphires are 4mm in size per and are AA quality gems. The stud earrings pair are set with a total of 1/6 carat of diamonds in high quality G-H Color, I1 Clarity. Earrings include friction-secure push-back closures. The sapphire studs are finished with rhodium-plating. These are a truly, high-end piece that will forever pleasure to wear. Get them today from Apples of Gold Jewelry with free shipping to your door via UPS or FedEx delivery. We guarantee our Blue Sapphire Diamond Stud Earrings Basket Settings, 14K White Gold to be high quality, authentic jewelry, as described above.